Most Monmouth history buffs probably will be surprised to learn that this county made a major contribution to the War of 1812 in the person of three sons of an Allentown doctor who achieved fame in battle and were associated with some of the great figures of that time. One even lost an arm while serving on a boat from which was fired the first shot afloat as that conflict erupted. Another became a rear admiral after a long and celebrated career marked by the mysterious and tragic death of his two sailor sons. But to return to Allentown in Monmouth. There one typical November day (the 17th) in 1794 was born to Dr. and Mrs. Thomas Montgomery a son who was named Johne Berrien (his mother's maiden name) who was destined for a career in the U.S. Navy. History does not record why anyone born in Allentown should hanker for the sea, but John Berrien Montgomery did and became a midshipman June 4, 1812, possibly because his elder brother, Alexander, was a surgeon under Admiral David Porter. His younger brother, Nathaniel Lawrence, also caught the navy fever and joined up, subsequently losing an arm in the famed battle between the U.S. frigate President and the British ship Belvidere off the Nantucket Shoals. John Berrien Montgomery served aboard the Hamilton, Madison and General Pike on Lake Ontario, then joined Commodore Oliver Hazard Perry in 1813 and "fought credibly" aboard the Niagara in the Battle of Lake Erie. It was in this battle that Perry penned the famed lines on an old envelope "We have met the enemy and they are ours two ships, two brigs, one schooner, and one sloop" and sent the dispatch to General William Henry Harrison. In the subsequent controversy between Captain Elliott, commander of the Niagara, and Commodore Perry over the Niagara's role in the battle, John Berrien Montgomery, like his shipmates, sided with Captain Elliott. Subsequently Montgomery served frequently with Elliott. In the Niagara he took part in the blockade and attack on Mackinac and on Aug. 4, 1814 he was aboard Commodore Steven Decatur's ship, Ontario, against Algiers off the African coast 1818-20. After promotion to lieutenant, he subsequently commanded the Erie on the coast of Mexico. A document as dry and prosaic as a census report, in its own matter- of-fact way, can paint a sad and terrible picture of war. Such is the case in the report of the Ninth Census of the United States, taken in 1870, while the Civil War was still a quivering memory. "The losses of the union Armies are fixed by the Surgeon General at something over 304,000" reported Francis A. Walker, superintendent of the 1870 census. "This sum, however, embraces only those who died during their term of service. There were discharged 285,000, on account of the several causes of disability recognized by the medical authorities of the Army. Probably two-thirds of these were discharged for disabilities not immediately affecting the duration of life. It is probably fair to assume that the remaining third may be added to the direct losses of the Army from wounds or disease. "Tens of thousands were discharged to die; tens of thousands died within the first few months after discharge. Tens of thousands lingered through the first or second year. If, in addition to these numbers, we allow for the accelerated mortality of the two million persons enlisted in the service of the United States who neither died in service nor were discharged for disability, but who carried with them the seeds of disease contracted under the hardships and exposures of campaigns, or returned to civil life with shattered constitutions though with no developed disease, 500,000 will surely be a moderate estimate for the direct losses among the Union Armies." Not so easily fixed were the losses of the Confederate Army, Mr. Walker observes. "We know that the total number of men enlisted into that service was scarcely more than half the aggregate of enlistments on the Union side. But, as on the offset, three things are notorious: first, the average term of service was much longer, being generally 'for the war'; second, the material of the Confederate Armies was more completely and continuously used; third, a much larger proportion of the sick and wounded died from the want of skilled medical and surgical attendance, of proper medical supplies, and of stimulating and nourishing food. Without attempting to deal at all nicely with this subject, it is difficult to see how anyone could, upon reflection, place the losses of the Confederate Armies at less than 350,000. "We reach, therefore, the total result of a direct loss to the male population of not less than 850,000. Popular opinion would undoubtedly place this total much higher, and, in such a matter, popular judgment formed from the contemplation of statistical data necessarily partial and incomplete." The Civil War, notes the 1870 census chief, had other debilitating effects on the country: It retarded the increase in the colored population, checked the increase in the "native" population, checked immigration and fostered "notorious growth of habits of life in many sections of the country which tend strongly to reduce the rate of national increase, and which, if persisted in, will make the showing of another census hardly so satisfactory as the present, even without a devastating war to account for the loss of hundreds of thousands in hospital and on the battle-field." Of the war checking the increase in the "native" population, the 1870 census head observes: "For nearly four years an average body of a million and a half of men, from 18 to 45 years of age, were withdrawn from domestic life. Speaking roughly, one-half of these were unmarried men, who, on account of their military engagements failed to form marriage relations. The other half were married men, whose families were rarely increased by birth during the continuance of the war. The number withdrawn from domestic life for four years bore no small proportion to the total male population of the ages when marriages are formed and children begotten." So, even a census report makes sad reading. We are old enough to have known Civil War Veterans, such as James King, and we remember the melancholy songs of our maternal grandmother (born at the beginning of the war) and we remember the sadness with which older people spoke of the war between brothers. The 1870 census report confirms our early feeling that the Civil War was sad, as war itself is always sad. A lively interest in the Civil War, plus an abiding fondness for Freehold, sent this reporter to the Monmouth County Historical Association Library the other day to get some idea of how Freehold residents reacted to the beginning of the War of the Rebellion a century ago. The fragile, crumbling files of the Monmouth Herald and Inquirer revealed some curious informa- tion indeed. The roster of "Capt. Mount's Company" disclosed that many of the surnames of the men are still common in this neck of the woods. Very likely many of the volunteers were forefathers of present day residents. We also learned that the volunteers were mainly of old stock. There were few foreign names. "Ex-Gov. Rodman M. Price has written and published a letter, in which he distinctly says that in case the Union is dissolved (and this he considers a foregone conclusion) and Northern and Southern Confederacies are formed, New Jersey ought to go with the South! "We would advise the Governor, and those who think like him, to remove to the South at once; for it is just as reasonable to suppose that New Jersey would go to the Moon in case it should conclude to secede from the Sun, as to suppose that New Jersey would go with the South in case two Confederations were formed. New Jersey will remain just where she is, loyal to the Union, the Constitution and the Laws; and those who don't like her position had better pull up stakes and leave at once." The editor of the Herald and Inquirer was C. S. Connolly and the publishers were D. & Jas. P. Connolly. The April 12 issue of the paper contained an April 8 dispatch from Washington. It's bold headlines were: THE IMPENDING WAR. IMPORTANT FROM WASHINGTON. DEPARTURE OF FLEET FROM NEW YORK, HIGHLY IMPORTANT. FORT SUMTER SUMMONED TO SURRENDER. REFUSAL OF MAJOR ANDERSON TO COMPLY! The Monmouth Blues, Capt. V. W. Mount, held a meeting in Citizen's' Hall on Monday evening last for the purpose of receiving volunteers to their company. At about 8 o'clock the Monmouth Blues entered the hall, accompanied by a large number of our citizens, and in a very few minutes after, the house was completely filled. Gen. Parker was appointed chairman of the meeting and James P. Connolly, secretary. Speeches, appropriate to the occasion, were delivered by Gen. Parker, J.D. Bedle and A. S. Cloke, all of which were received with great applause. The Star Spangled Banner was then sung by Messrs. J. M. S. Lokerson, L.S. Tlyer, R. P. Miller and G. H. Mitchell. The committee was appointed to raise funds for families who had enlisted in Capt. Mount's company reported that twelve hundred and forty dollars had been subscribed. An opportunity was then offered those present to contribute toward the good cause, which resulted in swelling the above amount somewhat. On motion of Mr. J.D. Bedle a committee of seven, consisting of Messrs. W. V. Ward, Daniel D. Denise, J. H. Rossell, H. W. Murphy, C. A. Bennett, R. Davis and G. Taylor,were appointed to distribute the fund. Here is the roster of Capt. Mount's Company: FREEHOLD: Capt. V. W. Mount, Lieut. J. T. Cottrell, Gordon H. Cottrell, Stacy Pitcher, William Spain, Thomas H. Estell, James Giverney, Henry Stahl, Charles H. Fleming, Anson Hale, E. Roth, William Brower, C. Y. Cornell, William Murdock, Samuel Conk, P. Johnson, John Young, J. Mogahen, Christy Garrity, H. Pitny, C. Huber, William Dydel, John L. Brindley, J. Reamer, Wm. H. Connolly, J. H. VanPelt, Alexander Chapman, Abraham Dock, E. H. Duncan, N. Taylor, William J. Mount, John W. Hulse, William H. C, T. W. Duncan, John Cass. Also Samuel F. Cox, William Poulson, J. H. Henhellin, S Barney, B. Bran-nin, J. Terrins, Abraham Murdock, Robert P. Miller, J. Phillips, J. Rosnell. (This probably refers to J. H. Rossell, the druggist), Nelson L. Cotrell, J. Clayton, J. C. Clevenger, Hugh Lokerson, John Thompson, Thomas Fitzgerald and A. Freeman. MIDDLETOWN POINT: Isaac Van Dorn, William Forman, Nelson H. Hart, M. Hoease, E. F. Disbrow. KEYPORT: Eusebins Walling, C. Britton, E. Stenhouse, T. Pope, William C. Aumack, William H. Murphy, William Pope, E. Wilson, Aaron Bedle, William McConkey, T. H. McCampbell, J. T. Smith, George W. Dell, B. Decker, J. Tice, F. Baedel, J. Lawrence. ENGLISHTOWN: N. Barriclo, S. McBride, T. Yetman, J. D. Hubert, J. T. Sanford, J. Stevens, William Stoney, G. Buckelew, S. M. McChesney, William Yetman and W. W. Applegate. The April 27 issue carried a lengthy proclamation of Gov. Chas. S. Olden warning of treason, and another convening the Legislature on April 30. Both proclamations were dated Trenton, April 21, 1861. CIVIL WAR DEAD, WHERE DO THEY LIE? Where lie the Monmouth men - and boys - who laid their lives on the line during the War Between the States, that terrible and bloody conflict that rent the Republic not yet a century old? It is hard now to recreate the poignancy of that struggle. Some of us still remember the Veterans of '61, James King, of Marlboro, for instance, who was the sole honored G.A.R. veteran in Memorial Day parades of the Thirties. The graves of the honored dead, some killed in action, others dead of war-related ailments, most departed of the ills that affect all men, veterans or no, are scattered in many Monmouth cemeteries, here in Freehold, at Red Bank and other places. On May 30 each year the Stars and Stripes and an occasional nosegay decorate their graves. Gone are most of their sons and daughters, even their grandchildren. Few remain who still even remember them. There is no monument to the Veterans of the Rebellion, not in Freehold, at least, where more than 1,000 men were mustered into the 14th, the 27th and the 29th Regiments in 1861 and 1862. There is not even a marker at Camp Vredenburgh in Manalapan Township. This oversight, or neglect, may be remedied, however, as the site of Camp Vredenburgh is within the acreage purchased by New Jersey for the Monmouth Battlefield Park. When and if a Civil War monument is raised there, it will not be necessary to purchase the land. If the young men who went so enthusiastically to war a century ago are neglected or nearly forgotten, their tragic dead are more so. Major Peter Vredenburgh, Jr., killed in battle in '64 is buried at Maplewood Cemetery at Freehold but where lie the other Civil War heroes? Who will list the last resting place of Captain Henry J. Conine, killed at the Battle of Monocacy, Md., that tragic day of July 9, 1864 a few weeks before Major Vredenburgh fell at Opequan, Va., or of Sergeant William B. Cottrell, or of Corp. Joseph V. Magee, Wagoner Abjiah Applegate, Pvt. Henry Borden, Pvt. Brindley Brand, Pvt. William Brown, Pvt. Isaac H. Gibson, all of Company A, 14th New Jersey Volunteers, and casualties in that terrible Battle of Monocacy in the summer of '64. Where are the men of Company A of the 14th, also killed in '64, Corp. Joseph L. Lake, killed at Mine Run, Corp. Charles M. Potter who fell at Cold Harbor, Pvt. Nathaniel W. Hankinson, also a Mine Run fatality, Pvt. Charles P. Layton, killed at Cedar Creek, Va.; Pvt. Barzillia Taylor who died at Mine Run? Where lie the men of Company A who died in prison, Pvt. Alien Dangler,White Van Buren, Pvt. Thomas J. Wilson? Where are the dead of Company D of the 14th, Capt. James W. Con-over who died of wounds received at Monocacy? (J.W. Conover Post, Grand Army of the Republic, Freehold, was named for him). Where lie 1st Sgt. William Church, William German, William A.N. Shores who fell at Monocacy. Or Jacob Armstrong, William H. Bills, Peter Brown, William H. Estelle, David Gorman (Was he a brother of William Gorman who died at Monocacy?) James Hawkins, Daniel P. Soden, who were killed in engagements at Petersburgh, Cold Harbor, Spottsylvania, Cedar Creek? Company G of the 14th lost 17 men killed in battle, died in prison camp or of disease. None-of its field officers, including Major John V. Alstrom, was a war casualty, but the battle dead among the men on the line in- cluded Corp. Jacob D. Griffin, John B. Cottrell, Jonathan Erickson, Elliott Fields, Asher Pearch, William Reynolds and John H. White. The 14th, composed of the three Monmouth companies, was attached to the Army of the Potomac most of the time, until it was mustered out at Washington, D.C., on June 18, 1865. It took part in the Campaign of the Wilderness and before Petersburg and in the invasion the latter part of June 1864. It was ordered to Maryland to help repel the Confederate Army under General Early. During that campaign it lost heavily at Monocacy, July 9, 1864. Later it became attached to the Army of the Shenandoah and partici¬pated in the battles and victories of General Sheridan in the Valley of Virginia where the gallant Major Vredenburgh fell in the charge at Opequan, near Winchester. This sketchy account of Monmouth men in the Civil War hardly does justice to their sacrifices and gallantry, but it is to be hoped that this series may stimulate efforts to erect a Civil War memorial at Camp Vredenburgh. The recent death of James B. Vredenburgh, 91, great-grandson of State Supreme Court Judge Peter Vredenburgh, of Freehold, brings to mind one of the saddest events in local history, the war death of and funeral service for Major Peter Vredenburgh who lost his life in the Civil War when he was only 27 years old. The funeral of the young lawyer took place here on Sept. 30, 1864. In late September in this part of the country, autumn is just beginning. The leaves have begun to turn but have not yet fallen and the golden trees lend to the streets peace and quiet. It was probably such a day when hundreds of townsfolk and the military gathered here to pay tribute to the son of Freehold's most prominent lawyer who had lost his life in a heroic charge at Opequan, Va. Among the mourners was Judge Vredenburgh who at 60 was a broken man, broken by the sacrifice of his son who was "laid upon the altar of his country to maintain the right to preserve the Union." The father's grief was described as "like that of Jacob when he refused to be comforted and said, 'I will go down into the grave unto my son's mourning.' "
It must, indeed, have been a sad occasion, that military service in the Reformed Church at Freehold, young Vredenburgh's home town. It was a sad termination of a career of great promise. Born in Freehold Feb. 12, 1837, Peter was the oldest son of Judge Vredenburgh. He became a lawyer "of high attainment and brightest promise." Admitted to the bar as an attorney in 1859, he opened practice in Eatontown "where by his attention to business, his gentle manners, and his love and fitness for his profession, he soon gained the confidence of the community, and acquired a lucrative practice." He entered the military service in 1862 and was commissioned a major in the 14th New Jersey Volunteers, raised and organized at Camp Vredenburgh, near the old Monmouth Battle Ground, just outside Freehold. The regiment left camp on Sept. 2, 1862 and was stationed at Monocacy, Md., where it guarded the Monocacy Bridge during the advance of the Confederate forces into Maryland and took part in the campaign of South Mountain and Antietam. The 14th fought in several battles, including the campaign of the Wilderness and before Petersburg. In 1864 it was ordered to Maryland to help repel the invasion of Confederate troops under General Early. At Monocacy, July 9, 1864, it lost heavily. Men of the 14th who were killed in action or died of wounds received at Monocacy included 1st Lt. Henry J. Conine, Sgt. William B. Cottrell, Joseph V. Magee, Obijah Applegate, Henry Borden, Brindley Brand, William Brown, Isaac H. Gibson, 2nd Lt. William H. Craig, 1st St. William Church, William Gorman, William A.N. Shores, Capt. James W. Conover, after whom the Freehold G.A.R. Post was named. In all, the 14th lost some 68, killed in action, died of wounds or disease or in prison. Soon after Monocacy, the 14th became attached to the Army of the Shenandoah and participated in the battles and victories of General Sherman in the Valley of Virginia, there losing its brave commanding officer, Major Vredenburgh who fell in the charge of Opequan near Winchester. Here is an account of the handsome Freehold soldier's last hours: "In the morning of September 19, 1864, after a night march of 20 miles, he came with his regiment to the banks of a little stream that flows past that historic field. Before them, 6000 yards away, stood the grim earth-works of the Confederates. For some hours they remained under heavy fire from the batteries, and a little before noon came under the order to assault the works. Major Vredenburgh mounted, placed himself at the head of his regiment, addressed a few words of cheer to the men, then shouted his last order to charge. The line moved rapidly forward over the crest of the hill, but had scarcely advanced a dozen paces when a shell struck him in the throat and he fell from his horse dead. "No better blood than his has ever reddened a battle-field, and no soldiers ever mourned the fall of their leader more deeply and sincerely than the men of the 14th lamented the death of Major Peter Vredenburgh." To those of us who are interested in Monmouth's history - and it is hoped that our numbers are legion - it is good news that progress has been made in locating the site of the parsonage of Old Tennent Church. The report, however, left this writer a bit unsatisfied as there was no mention of any physical trace of the old building that housed ministers of the "White Hill Meeting House", as Old Tennent was called a couple of centuries ago. We would wish, also, that The Transcript had seen fit to print the 1860 map owned by Edward P. Orr. Site of the parsonage is sought by the state Department of Conservation and Economic Development which is planning development of the Battle of Monmouth State Park. We would like to compare it with reproductions of other maps showing the old parsonage site. It is meet that Mr. Orr, and perhaps C. Richard Applegate, local authorities on the Field of the Battle of Monmouth 1778 should set about finding the physical site of the parsonage, and that the state initiate plans for rebuilding the structure which was said to antedate Old Tennent Church itself. An excellent drawing of it does exist, as we shall show, and this should serve as a model for restoration. Casual research discloses some interesting tidbits about the parsonage and about Old Tennent, not the least of which is the fact that the parsonage, and its surrounding acreage were purchased as a farm which should be held by the church in perpetuity. Later, an additional 100 acres were added to the original 500 acres; but, alack, a century later the church trustees decided that the parsonage farm was no longer needed or the church may have been short of cash and the place passed into private hands. In keeping with the original intent of the trustees, it seems fitting that the land has now become property which shall never be despoiled by commercial enterprise. A great deal of information about the parsonage is contained in a book, "History of Old Tennent Church," by Frank R. Symmes, 15th pastor of Old Tennent, written about 1904. References also are made to it by Ellis and Salter, Monmouth's two great historians. The most detailed account, however, is given by the Rev. Mr. Symmes. Mr. Symmes' book includes a map drawn from typography maps of George H. Cook and C. C. Vermuel, showing the site of the parsonage about a mile and a half from Tennent, on the Tennent-Freehold road, to the left of the present Pennsylvania Railroad bridge, facing toward Englishtown; also a fine reproduction of the parsonage itself. Mr. Symmes refers to Bensen J. Lossing, author of the Field Book of the Revolution, and a trip to the parsonage he took in company of Dr. John Woodhull, of Freehold, son of "the beloved minister of that name who succeeded Rev. William Tennent," pastor of Old Tennent for 46 years. Mr. Symmes thus quotes Mr. Lossing on the trip taken "toward the close of September, 1850: The Old Parsonage is in the present possession of William T. Sutphen who has allowed the parlor and study of Tennent and Woodhull to be used as a depository of grain and agricultural implements. The careless neglect which permits a mansion so hallowed by religion and patriotic events to fall into ruin is actual desecration and much to be reprehended and deplored. The windows are destroyed and in a few years not a vestige will be left of that venerable memento of the 'Field of Monmouth.' "
The younger Mr. Woodhull, incidentally, was born in the parsonage, which reputedly was built before Old Tennent Church, Symmes said in part of the old parsonage that "it was commonly alleged the house on this parsonage farm was erected in 1706. For some years the old house stood empty, a sorrowful reminder of men that were buried and of things that are past. It gradually fell into decay and became lamentably dilapidated, partly by the ravages of time and partly at the hands of relic-seekers who frequently stopped off the railroad trains which ran close by and carried away momento pieces. Finally, about 1861 the old building was taken down. The parsonage farm was sold on March 16, 1835, at auction to William T. Sutphen. July is real hot in Freehold. We were hung up in front of the old railroad station on West Main Street the other day, just as the mid-summer sun began to bake the town. Across the tracks we noticed a fresh evergreen, newly planted, bravely basking in the summer warmth. It was surrounded by a small fence and a circle of faded flowers. The inscription on the stone inside read: "This tree planted Nov. 11, 1928 in memory of Corporal James A. Gere, Co. G., 39th Infantry, 4th Division, who died of wounds received in action at Chateau Thierry, France, Aug. 30, 1918. Presented by John Gere and David V. Perrine." The long gone days of the first World War came flooding back, days when we were too young to know what the fighting was all about but days we remember from the old war songs,the sight of troops leaning out of trains and waving, the Liberty Loan rallies, the initial enthusiasm for war, and the subsequent ennui - men who left for camp and Europe and never came back - some buried there and others brought back to rest here. The Gere marker is a particularly poignant memorial for this writer as we were present at its dedication during our first days with The Transcript. In fact, the ceremony at the railroad station and the subsequent flag pole dedication at the Broad Street School that rainy November day so long ago, was one of our first assignments for this paper. Re-reading the story in yellowed files of The Transcript, we marveled that we could have been so touched by that patriotic exercise and that we could have written with such feeling about the parading of ex-soldiers including Civil War veterans and the nearness of the War of '17-'18. (The Civil War veterans taking part in the ceremony were James H. King, of Marlboro, and Sam Hankins. W.A. Hankinson Sr., rode in a car with Corporal Gere's parents, Mr. and Mrs. John Gere at the head of the parade.) At the railroad ceremony, Lew Tannenbaum, Legion Post commander, accepted the memorial, in the presence of 200 who paused for 30 seconds in silent prayer. At the school, Legion Commander Thomas Mahar presented the flag pole. It was accepted by George B. Conover, president of the Board of Education. The speaker was Assemblyman E. Donald Sterner who, according to The Transcript, urged support of the Kellogg Treaty (younger people and many of us who are older, will wonder what that was) and "gave a stirring appeal for peace." The treaty, said Mr. Sterner, was a "great aid to the fulfillment of peace." The assemblyman continued: "7,500 white crosses mark the graves of our flesh and blood in France. What service has America been to the world? Not for a gain is this so, not for conquest, but that the world shall be made safe for liberty and democracy!" There's been a lot of dam water wasted since those fine thoughts were expressed! The Transcript files also turned up names of other local casualties and reported casualties during the Great War: Fred S. Stokes, Co. M, 310th Infantry, reported missing in action Sept. 22, but his father had a letter from him dated Oct. 22! J. Woolsey Burtis, Co. A, 309th Infantry, a machine gun instructor, wounded, his father, William S. Burtis, was informed. Rulif V. Curley, son of Mr. and Mrs. William Curley, dead of pneumonia in France. The yellowed pages of the local paper record the sad events of long ago and far away"The moving finger writes; and having writ, moves onnor all your piety nor wit shall lure it back to cancel half a line nor all your tears washout a word of it. . ."
Embroiled as we are in this moon business, the Vietnam war and sundry other absorbing and sometime annoying affairs, it's easy to forget that war messed up the world just a half a century ago and profoundly affected the lives of untold millions. Not the least of those disrupted were more than 200 young men from Freehold and vicinity who were called to the colors. This was brought home to us the other day while leafing through Lewis History of Monmouth County. This book, published shortly after that world conflict gives a brief run-down on Monmouth's background from 1664 to 1920 and contains a list of county men who took part in the 1918 war. The list was compiled by the Red Cross from data furnished by the War Department. It does contain some typographical errors, and possibly errors of fact, but essentially the record of the young men in the war of 50 years ago seems adequate. A sad part of the listing is that devoted to those who were killed or wounded in action, or succumbed to disease. Pneumonia seems to have been fatal in those days. From the record, it appears that the majority of local boys went to war as members of National Guard Companies - Ambulance Co. No. 1, Company G, Second Regulars. The Ambulance Company numbered 180 from Freehold and Company G, 96. The Lewis History lists the names of some 53 local enlistees (Offhand we do not know how that number compares with the number of young men and young women from this place who took part in World War II, but we propose to do a piece on them at a later date.) Many local boys enlisted in a variety of other voluntary units, hence are not included in the Lewis History. Despite the number of local men who were in the armed forces during that critical time, few were casualties. Among these were James A. Gere, Pvt., Co. G, 39th Infantry, died of wounds; James Carney, of Matawan, killed in action, and Pvt. Francis Carton, Holmdel, killed. Dead of pneumonia in France were William Armstrong, James Carr and Rulif Curley. The wounded included Sgt. Harvey Barkalow, Co. M. 113th Infantry, David F. Hill and Edward Welsh. Freehold's 53 enlisted men included Frank Clayton, Otto L. Deed-meyer, Vincent A. Dugan, Charles H. Evold, George H. Gatlin, William and Thomas Mahar, Charles D. Miller, Adrian E. Moreau, Clarence Ray, Joseph A. Sherlock, and Benjamin Zlotkin. Officers were Joseph H. Conover, Charles F. Dittmar and William M. Hepburn. Officers of Company G, Second Infantry were Edward H. and Walter Yetman. In the ranks were Albert W., Alex L. and Henry H. Barkalow. Lester Brownell (Bromell? ), Harry Burke, John Carswell Jr., William A. Cox, Earl E. Dix, Joseph H. Hardiman, William S. Johnes, Ray J. Jones, George Kearns, George E. Kelsey, John P. McCann, Stacy Matthews, Rensen L. Meyers, Alfred Oakes, Clifton Pharo, Robert Quinn, Clarence Ray, William H. Rooney, Arthur L. Smythe and LewTannenbaum. In Ambulance Company No. 1 William J. Gaughan was the officer, and the ranks included David M. Carswell, Joseph H. Crine, William H. and Frank Crotchfelt, Eugene Foley, George E. and James A. Gere, Harry D. Hance, Fred Jennings, Jr., John V. McGackin, Fred Mariner, Charles E. Moreau, Howard D. Moreau, Walter H. Oakes, Warren Pullen, William Quinn, Jr., Benjamin J. Reimer, Theodore A. Smythe, Frederick C. Stokes, Oscar Vanderveer and Everett Woolfenden. Regretfully, space does not permit listing of more of the young men who went 'Over There." To recapture the spirit of the New Year as America girded for the big war, we delved, the other day, into the files of The Freehold Transcript and came up with some heart warming facts recorded by the paper's reporters and editors on Jan. 2, 1942. Though the day-to-day happenings in Freehold and vicinity, as dutifully set down by the scriveners of that day (including this writer) may have been trivial in the face of the world-holocaust, they were of great local importance then and even today convey the sense of duty that was sweeping the country. As the Second World War began, the Red Cross, the Freehold Woman's Club, the First Aid Squad and Borough and Township Defense Committees concentrated earnestly on contributions to the efforts against Japan and there were no anti-war pickets! In Freehold Township, Sherwen Benton was chairman of the Defense Council and Dr. H.B. Mason, of Freehold, was chairman of emergency services. The township conducted a survey of talents that might aid the war effort and Chairman Benton appointed Mrs. William Moore as the head of a typist group to evaluate such information. Allen Clayton was chairman of the health and first aid committees. Freehold women were mobilizing for war work at the Woman's Club under the direction of Mrs. George Dittmar, defense chairman, assisted by Mrs. Harry Ingling. Coal might, however, be in short supply, said Mr.Sinclaire, He advised laying in a good supply as transportation could slow down. First aid knowledge, a valued peacetime possession, became of increasing importance as the war heightened the possibility of disasters of all kinds. Those who passed the Standard Red Cross First Aid Course, given by the Freehold First Aid Squad, included: Mrs. Anna E. Smith, Miss Eleanor Ronan, Miss Kathleen Booth, Mrs. Eliza E. Orr, Miss Adelaide Van Sant, the Misses Mary and Ann Oberdorfer, Mrs. Florence Palmer, Miss Marion B. Voorhees, Mrs. Edith Bennett, Mrs. Stanley Orr. Lawrence Willis was the instructor. First Aid classes were not without humor, as some of us remember. There was the classic example of the disaster "guinea pig" who ended in the hospital after "first aid" by students of the art. The Monmouth County Chapter of the Red Cross announced a war chest of $120,000. W. S. Holmes, a veteran local fund raiser, was named chairman of a committee to raise money in this vicinity. On his committee were Dr. H. B. Duncan, Major C. M. Duncan, Douglas Sinclaire, Mrs. Emily Buck, Nicholas Torello, Mrs. Mildred Cole and Jack Flanagan, Freehold; Walter Addison, Englishtown; Clifford VanKirk, Marlboro; Edgar Poole and Samuel J. Brocklebank, Freehold Township, and A. Rulon Applegate, Farmingdale. Prominent in the local war news was the announcement that William Denise Baird, 23, son of the late Ira Baird, and brother of Mrs. Jurien Lott, had been named "one of the first flying cadets to receive wings as a naval aviator at the U.S. Naval Station at Jackson, Fla."
And to prove that the world is a small place, even in war, Douglass Schiverea and Paul Fitch, both of Freehold, met on a train in Washington, D.C. and discovered, to their amazement, that both had been training at Camp Blanding, Fla.
We had slackers, sure, those who tried to evade the draft, but they had scant public support. There was never any doubt that the Second World War was a people's war. Times do change! That Monday, following the Sunday that "will live in infamy" it was reported in The Transcript that people looked into the sky apprehensively as airliners droned by. All other aircraft had been grounded hours after the Japs had raided Pearl Harbor 17 years ago, almost to the day, and the hastily called Congress had declared war on the aggressors. Although we were far from the scene of conflict, we instinctively knew that dark days lay ahead and some of us would pay the supreme penalty that all of us would suffer and sacrifice. We knew, of course, that the passing aircraft was friendly, but perhaps it augured the eventual flight of unfriendly craft over our town. We had been on the brink of war for months perhaps for years and we were somewhat accustomed to tension, but many of us blithely believed that it would not happen and when the world blew up in our faces we were stunned. 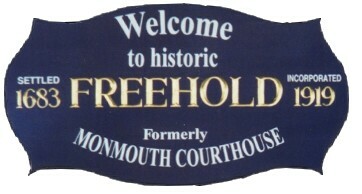 There was more than vague apprehension in Freehold that Monday, Dec. 8, 1941, when the Congress declared war. The local National Guard had recently been organized and it was certain that the Guard would be the first to be called up. What fear and anguish swept the hearts of the parents of those boys, none but the parents themselves knew. Mothers and fathers of the local boys who had registered for the draft the previous October were too numbed to believe that their boys faced the possibility of "fighting on foreign soil." To several families, the Pearl Harbor attack brought immediate fear and apprehension. Several local boys were in the Navy and stationed in the Pacific. Herbert Spitzner was aboard the S.S. Nevada at Pearl Harbor. First Lt. Albert Durie was on Corregidor. Pvt. Robert Ried was at Schofield Barracks at Oahu. Howard Morris Jr., of West Farms was aboard the S.S. Helena at Pearl Harbor. Lee Vanderveer of Howell was at Pearl Harbor. It was the beginning of fearful times, marked by acceleration of the draft, rationing, war news, casualties and stalking, naked fear. These things we knew instinctively as we watched the droning aircraft that sunny day 17 years ago. Under the aegis of Max Finegold and big, bluff Clifford Roberson, ably assisted by Miss Bertha Van Derhoef, the local draft board went into action to call to the colors every able bodied young man in this vicinity. We had seen the first draftees march, somewhat sheepishly, up West Main Street, accompanied by members of the Draft Board enroute to basic training. We were to see many more depart more quietly, some never to return. Bill Carney rigged up an alarm system at the Firehouse. School Superintendent Lloyd S. Cassel organized grammar and high school students for the war effort. Though most of us knew little about war, we settled down to "do our part." There were those among us who knew war more intimately, the Spanish American War veterans, those who had fought in the first World War. In the heat of patriotism, Freehold, like thousands of towns throughout the land, erected a roll of honor, listing all those who were in the military. Soon the board was dotted with silver and gold stars, signifying the wounded and the killed in action. The Roll, adjacent to the old Court House, now the Hall of Records, grew and grew and long was a part of the local scene. But man forgets. The war itself was forgotten, moved back into limbo, except for those whose sons lay in foreign soil, or beneath the sea. In retrospect, that Monday, Dec. 8, 1941, seems far away, but the apprehension and the fear were real enough here when we watched the planes overhead that sunny Fall day. In the "olden days" when draftees went off to war, patriotic citizens did their best to make their departure as cheerful as possible. If anybody had picketed the Draft Board headquarters on Court Street in Freehold, he would have been torn limb from limb. If anybody had doubts about America entering World War II, he was discreet enough to hold his tongue. Such was the spirit of that time. Disturbed that the young draftees should go off to the wars without fanfare, other than marching up West Main Street to the railroad depot, a group of representative citizens gathered in the Legion Home late in July 1942 and decided that it was the duty of the home front to do better by the prospective soldiers. Subcommittees were formed as follows: Chriney Conover, Colts Neck; Sherwen Benton, Freehold Township, and William Turner, Freehold. (The last, if he was the William Turner we remember, was a guard at the Freehold Trust Company and was a veteran of the Boer War.) Other sub-chairmen were to be named in the territory covered by Draft Board No. 2 which included the western part of Monmouth County. (On the board at the time, or during the war at one time or another, were Max Finegold, and the late C.H. Rober-son and Frank P. Moreau. Miss Bertha VanDerhoef was clerk of the board during most of the war. The next group of drafteesnumbering 86-was given the first farewell party at draft headquarters, with free soft drinks, doughnuts and cigarettes, courtesy of Mayor Murphy. Future draftee parties were to be financed by card parties, for which Mrs. Mae Lewis was arrangements chairman. There is a universality about young men going off to war and its principal components is sadness. The Transcript reported, however, that the Aug. 13, 1942 departure was "cheerful, albeit sometimes tearful". Chairman Welsh pointed out that "the occasion of boys leaving during war is necessarily a sad one, for those left behind, as well as for the boys, and the homefront owes it to the future soldiers to make their departure as cheerful as possible." If the roll was up in 1942, it would have continued the following names of young Freehold men who had been drafted the previous February: Frank Alston, William Brodie, Thomas LeRoy Banks, Thomas Bradford, Walter Jackson, Jr., Samuel A. Evans, Samuel Alexander, Joseph A. Hardy, Howard A. Johnson, Harry Jeffries, Raymond M. Kelsey, Steve Kostenchko, Fred J. Lewis, Lester A. Lewis, William B. McGlory, John J. Maher, Jacob Ogulif, Norman R. Riopel, John W. Ralston, Joseph T. Scanlon, Otto G. Ward. Also these volunteers: Robert Blimbaum, Deming Fairbanks, John J. Horton, Alfred S. Petit, George S. Pulos, Charles J. Carrigan, Benjamin Benton, James J. Quinn, George J. Tela, Lawrence Cougra, John T. Bennett, Stanley Morris Davidofsky, Isadore I. Zlotkin, John F. Bartek, Joseph D. Hill, Otto F. Frick and Arthur F. Kreisman. It all seems long ago and far away, but by mid-1942, after the first shock of Pearl Harbor, the local war gears were beginning to mesh, youngsters by the score were being called up by the draft, or enlisting, and the homefront was girding itself with rationing, purchase of war bonds and riding high on the wave of patriotism. All this may seem strange in the light of today's attitude toward war, especially the one in Vietnam, but to those who participated in World War II, there was little or no doubt and a great deal of enthusiasm. Perhaps the difference was that we had real villans in 1942 Hitler, Mussolini, Tojo, and we knew what we were fighting for at least we thought we did and that was enough. Wars and Wars and Rumors of Wars.